I’m starting to believe that fan of the site and frequent podcast guest Zach Barth of Zachtronics is trying to drive me crazy. Spacechem is a game that I refer to as my “white whale” thanks to its challenging puzzle solving and I swear that Infinifactory has caused my brain to overheat. 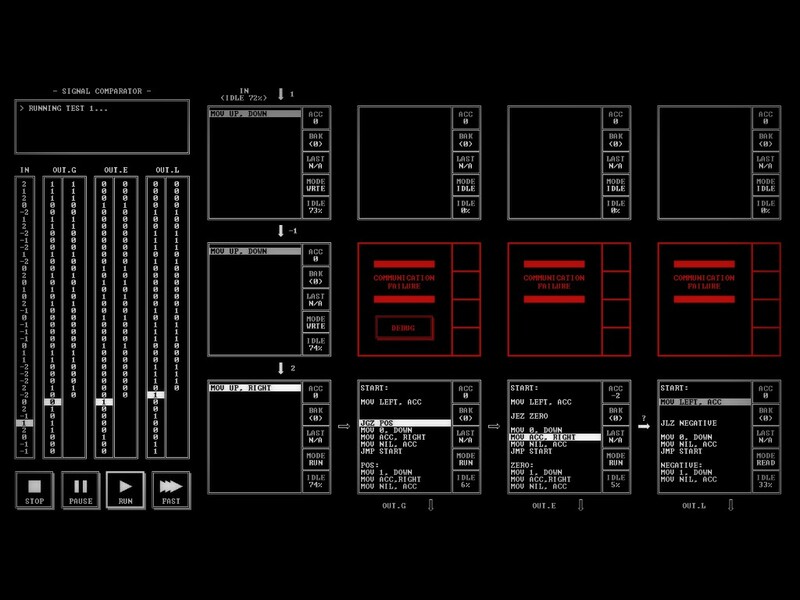 With his latest game TIS-100, Zach has gone way retro with a game literally about assembly line programming. 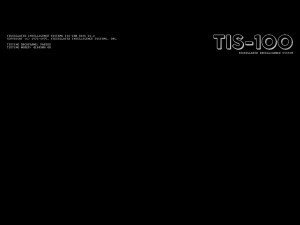 TIS-100 is less of a puzzle game compared to previous titles and more of a take on assembly line programming. After reading the instruction manual which the game suggests you print out, you learn that you received this machine from your aunt who asks you to try and figure out what your deceased uncle was working on with it. To dig into the machine, you need to solve programs using the game’s assembly language interface. 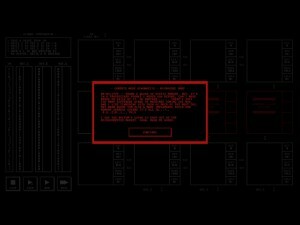 Previous Zachtronics titles had elements of programming and critical thinking with the wrapper of the story and aesthetics; not so much this time. You’ll be spending your time staring at the nodes as you try to build a program to meet the puzzle’s requirements. 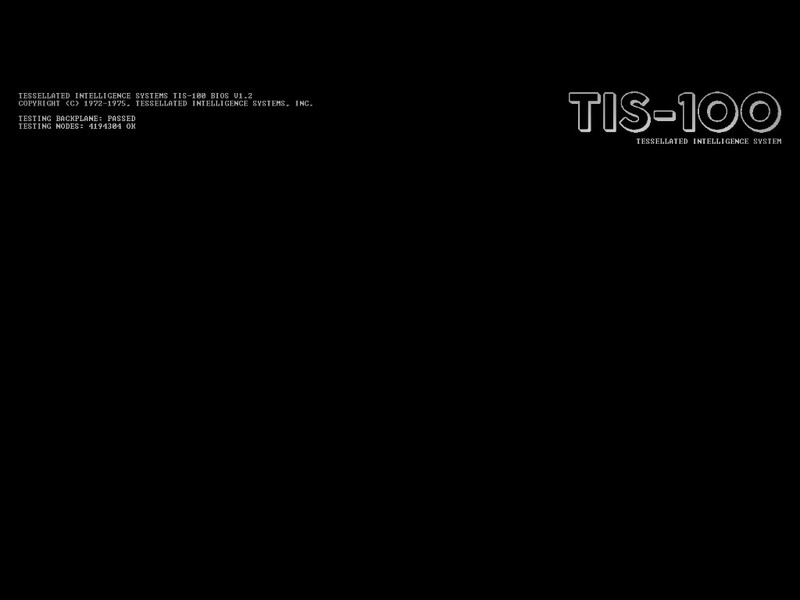 Figuring out how to play TIS-100 is all about the manual, as it provides you with the commands and syntax needed to make everything work. Just like with Spacechem, everything is laid out for you from the get-go, and the game is about what you put into it as you hopefully improve over time. The language is pretty basic (no pun intended) and for programmers playing, this should seem like a walk in the park. Each node will do orders from top to bottom and then repeat. Using conditional statements and labels will allow you to jump to specific parts of your code to either perform select code or skip statements you don’t want to process. Understanding how to code like this and make use of a basic computer interface is a good first step for someone brand new to programming and program logic, but don’t expect to go from this to building your own game from scratch. The histograms which have become a Zachtronics staple are once again here; as you attempt to beat your friends or question how the hell they were able to be that much better than you. While your tools/commands don’t change as you get further into the game, each new program will challenge you to use them in new ways and to optimize them in order to beat your friends. 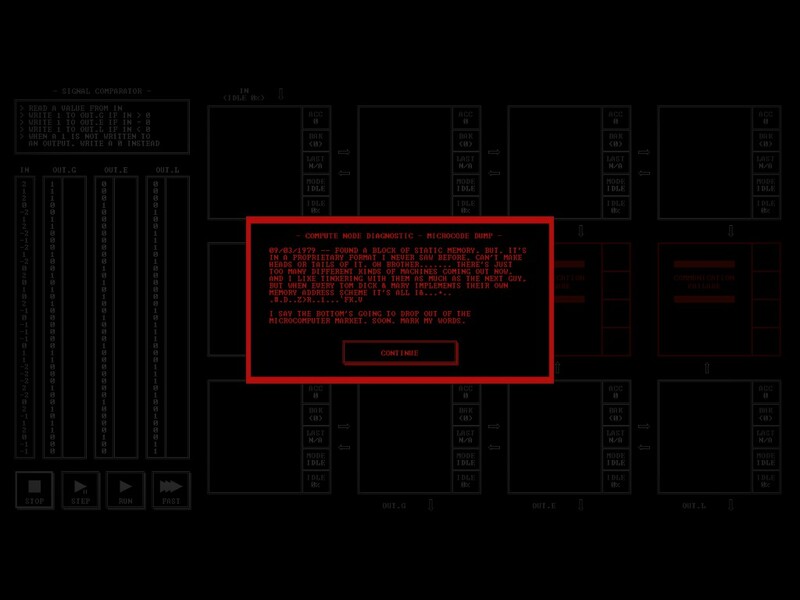 The game’s story is told through finding debug logs which are remnants from your uncle and like with Spacechem’s story, will become deeper as you get further in. And that’s pretty much TIS-100 in a nutshell and once again puts me in a tricky spot to critique a Zachtronics game. 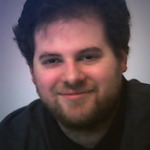 TIS-100 is very similar to Zachtronic’s previous games for good and for bad in terms of design and accessibility. Like Infinifactory and Spacechem, there is a lot here for the discerning fan to pore over and create custom solutions (and puzzles with the editor.) If the game clicks for you and you start understanding and improving at it, you’ll have hours of challenging puzzles ahead of you. But if things don’t click, expect to hit one hell of a brick wall. Just like with the recently mentioned games, there are no hints or in game guidance to help you out if you get stuck. I had to read the manual a few times to get the basics out of it and I still don’t understand the advanced functions, but I think part of that is due to my learning process. I’m a visual learner and prefer examples and real experience as opposed to reading instructions. This is why Infinifactory was a lot easier for me to grasp than Spacechem and TIS-100, because I could actually see how my solutions would grow and play out step by step. Due to the lack of in game help as with Spacechem, once you get stuck on a puzzle there is no way to learn what you’re doing wrong from inside the game. 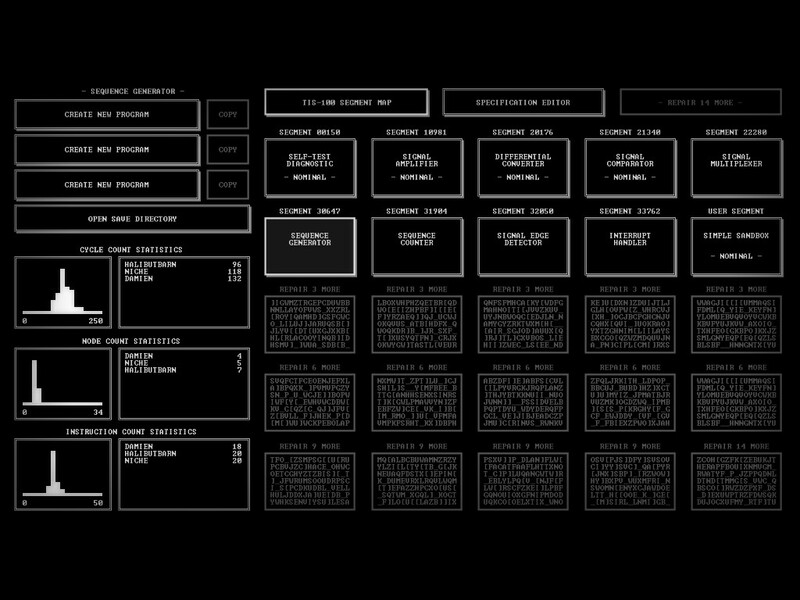 It’s important to keep in mind the other major point when playing TIS-100 or any other Zachtronics’ game: You’re only to get out of it what you put in. If you’re looking for a game that will walk you through how things work, this isn’t for you. Personally in terms of accessibility, I would say Infinifactory is the most accessible followed by TIS-100. 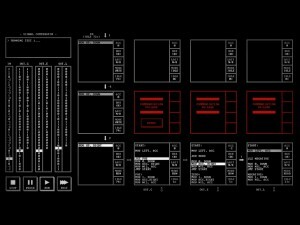 TIS-100 continues Zachtronics’ run of interesting and very unique puzzle games. It serves as a great middle ground between Spacechem and Infinifactory in terms of accessibility and challenge. While it’s not for everyone, if you enjoy programming or previous Zachtronics’ titles, definitely boot this one up. For more on TIS-100, here is a spotlight/tutorial I made for the game.